Guinea Pigs may not speak our language, but they do vocalize and use their bodies to communicate their feelings. Here are some things to look for and better understand your guinea pig. Rumbling is a sound made by a courting male or a female in heat. Teeth Chattering or Hissing are signals of an angry or aggressive guinea pig, so stay clear. High-pitched Squeak is an alarm signal, indicating fear or pain. Whine or moan squeak can mean the guinea pig is annoyed or doesn’t like something. Wheeking has a sound similar to a whistle or long, loud squeak and is a call for attention or shows excitement. Chirping like a bird is still not understood. Hopping straight up is called Popcorning. It’s usually seen in young guinea pigs who are excited, playful, happy. Freezing is standing motionless when startled or unsure. Sniffing – The guinea pig’s sense of smell allows him/her to check out surroundings. Touching Noses is how friendly guinea pigs greet each other. Signs of Aggression – rising on hind ends, showing teeth, strutting (moving from side to side), hair raised, often accompanied by aggressive vocalizations. Strutting can also be a mating dance. Scent Marking – Guinea pigs will rub their chins, cheeks and hind ends on anything they wish to claim. Mounting can be sexual or a show of dominance. Fidgeting while being held can mean the guinea pig needs a bathroom or it doesn’t want to be held any longer. 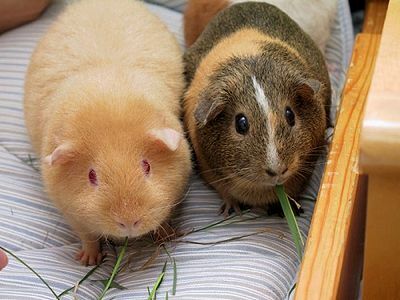 Some guinea pigs will run away when a human comes close. But with time and patience they learn that being picked up means petting and playtime. Learning and paying attention to your guinea pig’s signals can help you bond together and become good friends.